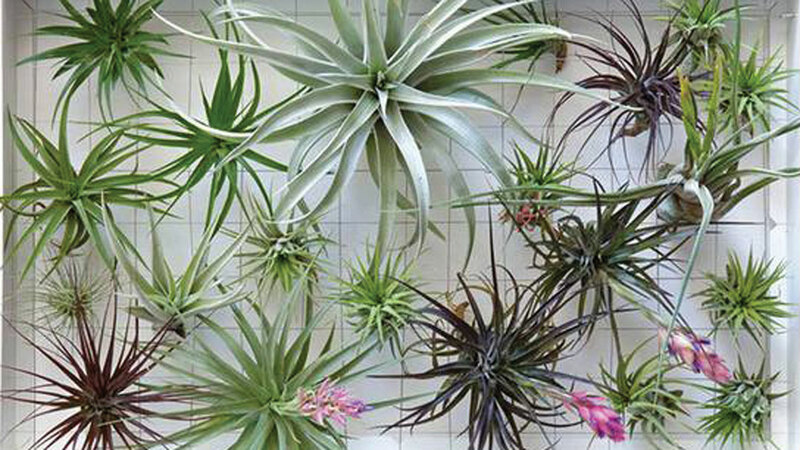 Airplants(Tillandsia) - bring sophistication to bathroom décor. 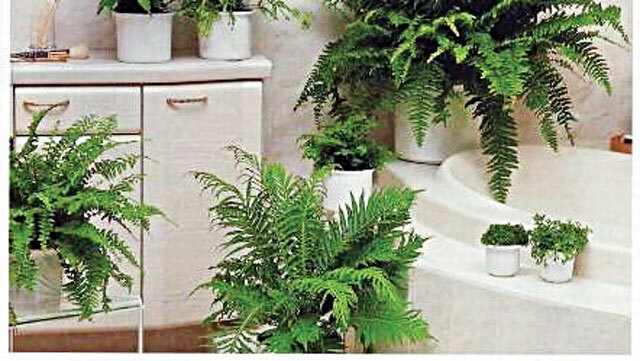 Ideal position; ferns thrive in high humidity of bathroom. Growing plants in the bathroom has surprisingly many advantages, not only do they help purify the air, they have the ability to eliminate bacteria and absorb excess moisture. They can turn your bathroom into a calming, spa-like space where you can de-stress. What is more if you’re looking for bathroom décor that is simple, elegant and cheap or looking for ways to bring a little bit of beautiful green nature to different parts of your home, try raising some or all of these indoor plants that are known to thrive in steamy humid and low light conditions. The typical low light, high humidity, and warmth of the bathroom is exactly what most tropical house plants are missing in their lives beyond their natural forest habitat. As natives of tropical forests, they love humidity and will thrive in the steamy confines of a bathroom. They will also grow in indirect sunlight because in the tropical forest, the tree canopy constantly filters the light. They all will grow in indirect sunlight from a window or skylight which should be enough to make them happy. They also like the same indoor temperatures as most people (55-75 degree F). Few may require a bit more pampering but nothing extreme.There is a trick to keeping house plants thriving in dryer climates: it’s the bathroom. So if your house plants are struggling, gather them up and put them in the bathroom. 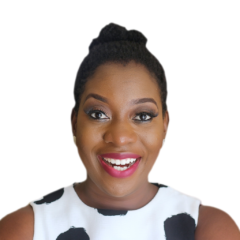 Then again, if replacing your tiles or installing a new vanity cabinet lies outside your budget, you can afford this one truly luxurious upgrade- transforming your bathroom into a tropical paradise with plants. Indoor plants are usually found in entryways, living rooms and kitchen, keeping a small plant on the office desk is not unheard of either (and is actually recommended by health professionals) But why limit your green thumb to only these area? These houseplants pretty much grow themselves. Add to your first aid arsenal a low maintenance Aloe Vera plant. The sap from Aloe Vera is used to heal minor cuts and burns and also as a skin moisturiser . While it is a very useful plant, it is also very attractive. It is also easy to propagate by repotting the pups. Plant your Aloe Vera in a terra cotta pot that will support the top heavy growth and encourage air circulation. As a succulent, it needs little water, but prefers bright indirect sunlight, especially in cooler temperatures. An Aloe plant will grow in the same pot for years, if you do decide to use the leaves, don’t remove more than a third of the plant, at one time. Orchids while a bit temperamental, pack so much tropical punch- after all they keep their gorgeous blooms for months. The damp, warm conditions in most bathrooms are perfect environment for this glamorous plants, which grow on bark instead of soil and prefer that material is damp but not wet. There are different varieties (or breeds) of orchids. For ease of care, try an orchid of the Phalaenopsis, Dendrobium, Paphiopedilum varieties. These orchids do particularly well in bathroom as long as it is well ventilated. This will help protect the orchids from mould and rot due to too much moisture. It’s botanical name is Sanseviera trifasciata. The common name includes snake plant due to the scale-like patterns on its leaves. Some refer to it as ladyfinger plant because of the leaves elegant shape, or mother-in-laws-tongue, because the leaves end in hard, sharp points and because it lasts so long, or Saint George’s sword, or viper’s bowstring hemp. This popular ‘impossible- to- kill’ long lived houseplant is an ideal specimen for those too busy to provide much care to their plants. Sanseviera varieties tolerate almost any growing condition; from nearly no light to bright light to direct light. They require little to no water, and if you keep them in a humid bathroom you might never have to water these our tough West Africa natives. Variegated forms need more light. Just pay attention to how fast your Sanseviera is growing. If it begins to grow rapidly, it may require transferring to a large pot. There is a dwarf variety Sansevieria trifasciata ‘Hahnii’. If you are lucky, your plant might even reward you with a flush of fragrant white flowers. I just love the modern lines of those variegated leaves. Ferns are popular house plants, their unfurling leaves are beautifull. Ferns do best in bathroom with low light. 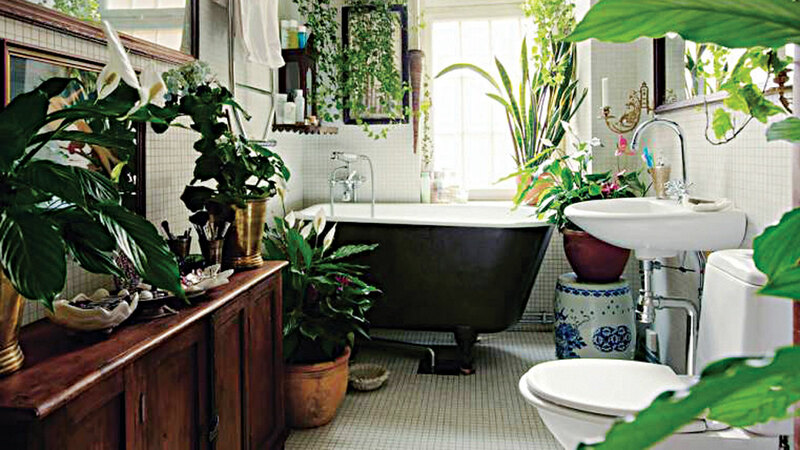 Place a potted fern in the corner of your bathroom. If you are feeling adventurous, hang your fern right over the shower itself. Just make sure that your fern isn’t being directly hit with shower water, and that its hung low enough that you can reach it to monitor the dryness of its soil. You should only water the fern when the soil becomes dry. Ferns require mild to cool temperature, so although they are they are able to stand the occasional warm shower, you should make sure your shower stays around 70 degrees Fahrenheit most of the time. If you are wondering which variety of fern to start with, the common Boston fern makes a good choice as this variety thrives in bathrooms. The flowers of peace lily are its most striking feature. The white flowers are the long thin white panicle that is surrounded by a white leaf-like structure called spathe, which gives the common name ‘white sails’. But the spathe that starts out bright white fades to yellow or green as its ages. Peace lilies prefer warm humid conditions and shade, which makes it an ideal candidate for the bathroom as air purifier and bringing elegance to the decor. House plants don’t get easier than the ‘no fuss’ Spider plant. Spider plants just keep giving. You almost never see a spider plant that doesn’t have babies attached and they are so cute. The pretty, green and white spider plant has been a popular indoor plant for years, due to how easy it is to care for. It is also long lasting and reproduces quickly. Often grown in hanging baskets, spider plants will get two to two and half feet wide and 2-3 feet long. This plant famously grows ‘shoots,’ ‘babies’or ‘pups’ (smaller version of itself) from tendrils, which hang from the mother plants. These ‘pups’ can either be pruned or planted to grow even more spider plants. Spider plants are great at cleaning the air around them. 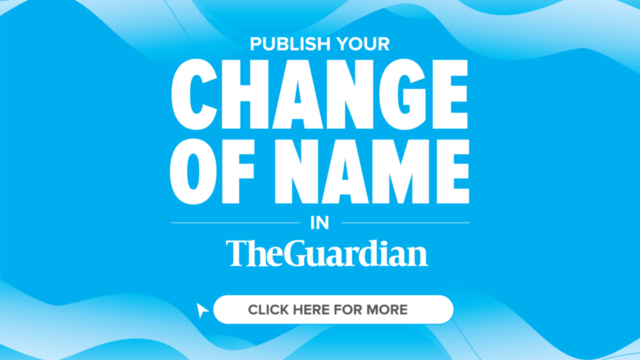 In fact NASA tested their ability to remove formaldehyde from a sealed plexiglass chamber, and found that spider plants were able to remove 95 per cent of the substance within 24 hours. To grow one of these clean air champs in your bathroom, simply hang your plant near bathroom tub. Spider plants love moisture,and can thrive in either direct or low light conditions. One of the most popular vining plants is Pothos or Epipreneum aureum. It comes in a variety of leaf sizes, colors and variegations. As long as it stays out of direct sunlight and its soil doesn’t dry out (it doesn’t care for over watering either), it is a low maintenance beauty that is exceptionally pretty in hanging baskets or on a high shelf where it can trail to its heart’s content. Neon Pothos (Epipreneum aureum) is such a burst of color that it almost hurt the eyes to look directly at . All Pothos are air purifiers and excellent at filtering out formaldehyde and carbon monoxide. All types of pothos are toxic if ingested by children and pets. If you have a penchant for killing any houseplants left in your care, you may be hesitating to bring things into your bathroom. But fear not. There is one plant that is confirmed ‘black thumb’ should be able to raise without issue: the Air plant Tillandsia species. These spiky little delightful plants have become very popular décor trend in recent years, and to keep air plant in the bathroom. Tip The more silver the foliage, the more drought-tolerant it is. Depending on how warm your home is and how much sunlight your air plant receives, it will need misting up to three times per week, even with enough moisture. These plants are a fun conversation piece tumbling over the edge of a container or hanging basket. The succulent likes bright indirect light, sandy soil and infrequent watering. Cuttings are easy to root, so you can grow this whimsical plant in your bathroom. Also sometimes, adorably referred to as Monkey Cups, Nepenthes, are a widely diverse genus of tropical plants that display some variation of the distinctive pitcher apparatus (filled with liquid that attracts and helps digest insects as food). Contrary to popular belief you don’t need to “feed” insects to these plants because the average household has enough to tide one specimen or two. Pitcher plants like their soil kept moist, and they love humidity- so they will be quite at home in the bathroom. They will tolerate low humidity, but will produce fewer pitchers under those circumstances. Their vining habit makes them a captivating addition to window sills.